Maxillary second left molar presenting with an acute pulpitis. 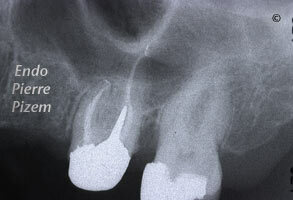 Root canal system preoperative condition: Calcified canals and a huge attached pulp stone obliterating 80% of the pulp chamber precludes any possible root canal procedure. 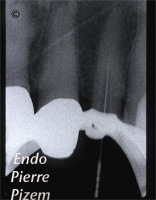 Procedure done under high magnification (Micro endodontics): An access cavity is made to uncover pulp stone coronal part, then a groove surrounding the attached stone is carved with a Buc 3 Ultrasonic Tip until it gets loose enough for complete removal. 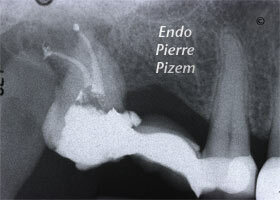 Unfortunately pulp stone was firmly attached to pulp chamber walls, thus, it had to be cut into pieces to allow for its removal. 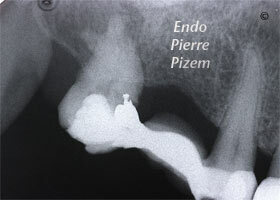 Following pulp stone removal procedure, narrow calcified canals had to be located with the help of a microscope. 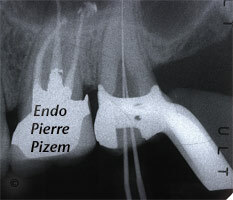 At last, canals could then shaped, cleaned, disinfected and filled. 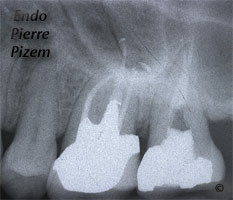 First preoperative X ray dental image displays a previously started root canal. 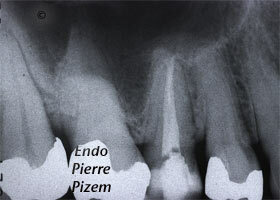 This tooth was referred by a clinician who could not locate the four calcified canal entries. Careful removal of calcification with ultrasonic tips (BUC3) under high magnification, allowed for this root canal treatment to be completed. 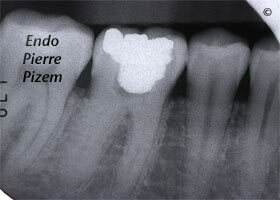 There is at the present time no other way than the use of a microscope to preserve such a calcified tooth. 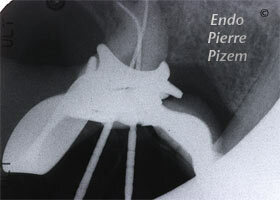 A Vertucci type VI pulp space configuration can be described as follow: Two canals leaves the pulp chamber, intersect in the body of the root and redivide short of the apex into two separate canals with two distinct foramina (2-1-2). 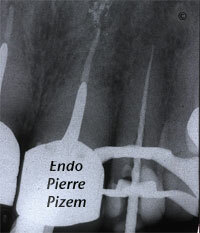 In this per operative X ray dental film, crossed canals are highlighted with endodontic ISO files within the root canal system. 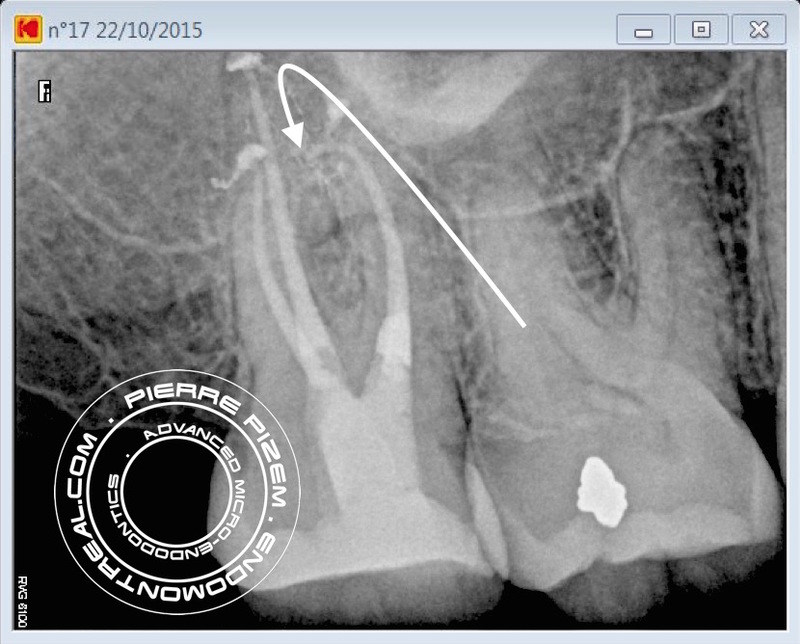 During shaping procedure, only one file at once could pass through the root canal intersection in the body of the root, each root canal branch has been shaped cleaned and filled individually with lateral and vertical condensation. 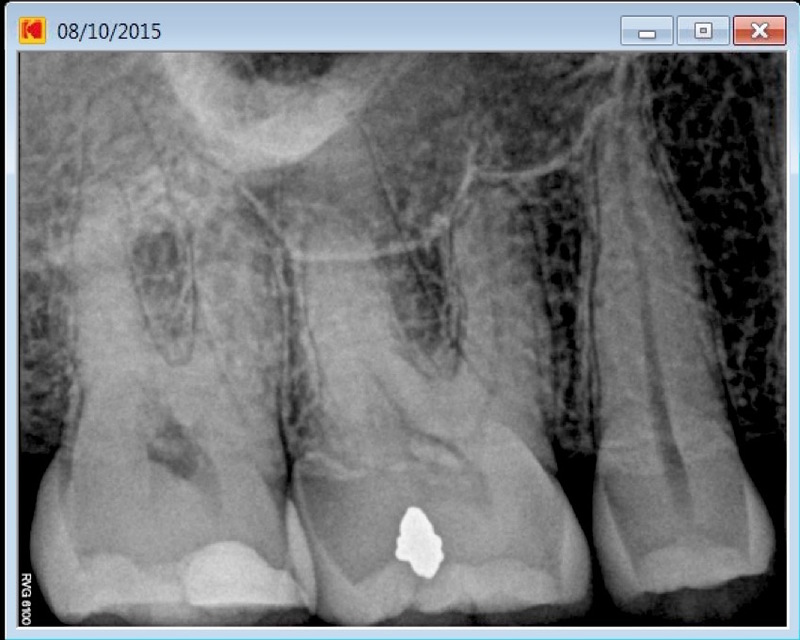 Preoperative radiological findings that might help us in suspecting such a pulp space configuration: root canal abruptly becomes invisible short of the apex. 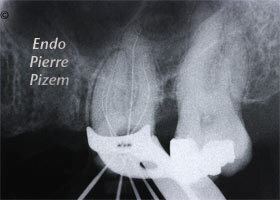 Armamentarium: OPMI PROergo dental operative microscope from Carl Zeiss, Rubber dam and rubber dam clamp and frame, Stainless steel K endodontic files, gutta percha and Pulp Canal Sealer, finger plugger. 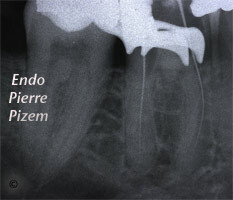 A New Dental Operative Microscope (D.O.M.) 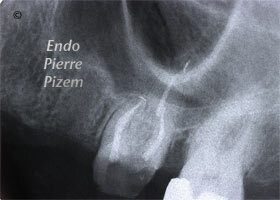 Assisted Root Canal Treatment on Maxillary Incisor with a Calcified Canal. 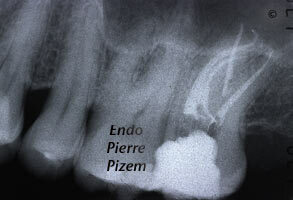 Patient has been referred for dental operating microscope assisted root canal. 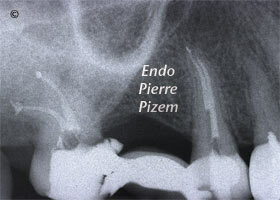 Acute pain on this heavily restored lateral incisor kept the patient awake all night long. 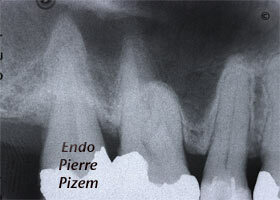 Pulpal necrosis and acute apical periodontitis is the diagnosis. 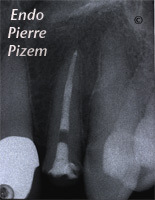 Radiographic findings: Pulp chamber is not visible and root canal is barely visible in its last apical third on preoperative X Ray of this maxillary lateral incisor. 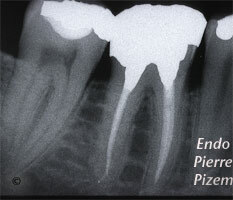 This is because dystrophic calcifications in the whole canal system are completely obliterating the pulp chamber as well as two thirds of the root canal itself. 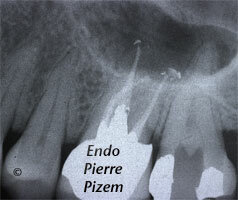 It can be expected that the root canal entry is completely embedded in a mass of adherent pulp stones. 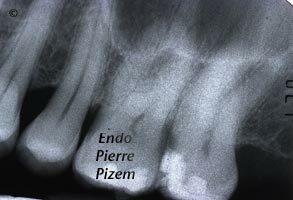 Diffuse calcifications preclude easy canal entry location. 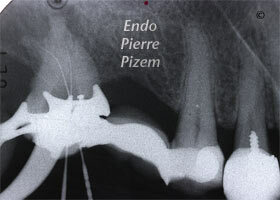 Problem number one to solve: Creating a pathway to the remaining portion of root canal with patency without perforating the root laterally and without destroying to much sound tooth structure in order to keep tooth restorable. 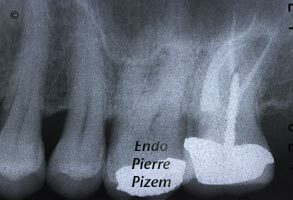 Problem number two to solve: Locating root canal entrie (which is located very apically in the root canal system) without perforating the root and without destroying to much sound tooth structure in order to keep tooth restorable. 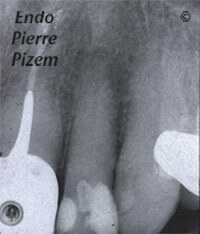 Taking into consideration the fact that root canal system is not visible on pre operative Xray dental film, and being aware of the technical problems that might be expected during the endodontic procedure, an antibiotic therapy (which is going to leave the patient in pain for another two or three days) followed by an apicoectomy with a retrograde MTA filling might have been considered as an option. But, then again for how long? 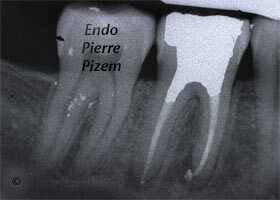 Tooth crown is heavily restored and when the time comes for a PFM, a space for a post is going to be needed anyway. 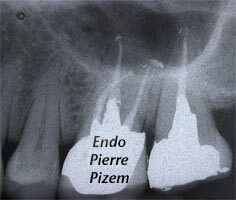 By locating and treating this root canal STAT with calcium hydroxide, pain will subside almost on the spot and canal prep for a post will be obtained by the same token. 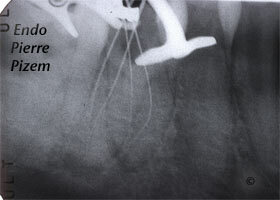 Patient is given full knowledge of the possible risks and benefits of such a complex procedure. 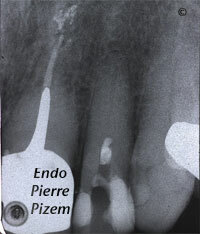 Patient just wants the pain to stop, he also wants to keep his own tooth. An informed consent is given. 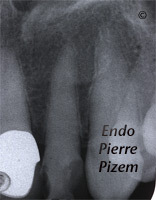 In order to save that tooth, calcified dentin must be carefully removed with long thin ultrasonic tips under the high magnification of dental operating microscope (OPMI PROergo from Carl Zeiss). 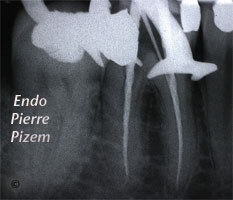 No rapid technique exists for dealing with calcified root canal systems. 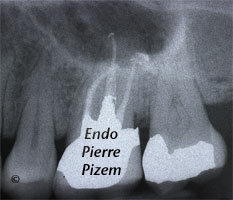 Progressive abrasion of dense calcifications both in pulp chamber and root canal led to the canal entry in the last apical third of root canal. 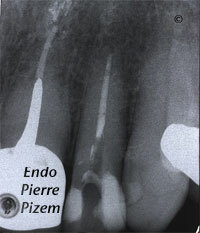 24 mm long root canal has been easily shaped and cleaned with Protaper endodontic files and 06, 08,10 K in combination with chelating agent (RC PREP). 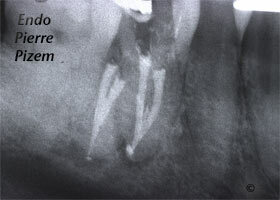 Canal system has then been filled with calcium hydroxide for 8 to ten days. 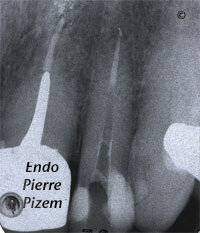 It has then been filled with Pulp Canal Sealer and vertically condensed Gutta percha. 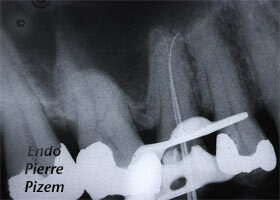 Provisional filling material: Clip from Voco. 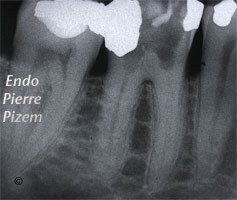 Last X Ray dental film is a post operative control. 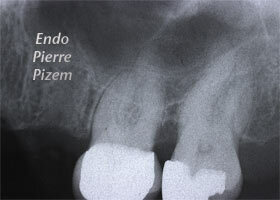 Casted post and crown are planned for this tooth.